I call myself X, but this is not my name. The sad truth is: I have no name. If we are lucky, names are gifts bestowed by those who love us. If we are unlucky, they are just given to single us out. No one ever wanted to single me out. I am a Grundo. I live in the adoption center of Virtupets Space Station. My parents supposedly were forced to serve Lord Sloth and I was forgotten here among thousands of other little Grundos, who have no family, no home, no name. Now and then people will stop at the adoption center and look at us. The Grundo in charge of the adoption center will warn them that we slobber and cry at night. Personally I think that’s not the best strategy to make people consider adopting us. Besides he’d slobber too if he had to eat the food that we have to force down our throats. I’ll only say it’s not the kind of meal that is content to stay down. I admit the crying is a problem. It makes it hard to sleep. On the other hand, when we huddle together at night in the cold emptiness of the space without as much as blanket, it is hard to keep up hope. Thoughts wander inevitably to Sloth, his so called Grundo Reeducation Center and what will happen to us if he returns. If he has a home, it’s Virtupets Space Station. I think it’s too much to hope that he wouldn’t attack here first and then we’ll be at his mercy again. Yes, we do have a lot to cry about. Not even the master of the adoption agency can keep all the visitors away. Some will ignore him and select a homeless, little Grundo, make them part of their family and give them a name. I usually play least in sight when that happens. I am cursed with intelligence. No, really! Most Grundos start out pretty dumb and only develop more wisdom if they are properly educated. I have pondered this and think it’s a survival trait. If you aren’t able to comprehend how really bad your situation is, you aren’t tempted to lie down and just give up. Admirable! I wonder each morning why I should bother. I never find an answer, yet I get up anyway. Maybe I am not that intelligent after all. What has that to do with finding an owner to take me away from all this? Well, I don’t have a name, but I do have ears. And I hear the Neopets whisper about The Pound, down in Neopia. Our food might be in the running for the award of most horrible food this side of the universe, but at least we do get food! The pets which are abandoned to the Pound starve. And then there is the sky. Down on Neopia proper one can rarely see the stars. One can see them only at night and even then the clouds may cover them. Here, I can see them every time I look out of the window. They glitter and shine in the relentless inky black of space and are so heartrendingly beautiful that one is able to forget even the most horrible anguish. So I ponder this, and then my chances of finding an owner who will actually keep me instead of abandoning me into the Pound after a week. Are you still with me? Then, I think, the time has come to finally describe myself, unhappy task as that might be. I am one of the marvelous, enchanting, galactic green Grundos. In other words I have poisonous green skin and bulging red eyes. I would say I look like a Greeble, but that would probably offend the poor, innocent Greebles. Yes, I have serious self-esteem issues. So sue me! Worse than not being the most beautiful of pets is that my colour is quite common. Green isn’t just a basic colour for Grundos, it’s a basic colour for all Neopets. Since I do have a well working brain, I can calculate the chances for a theoretical owner finding a pet they like better than a plain, green Grundo with emotional issues the size of Terror Mountain. And the answer to that question is why I hide whenever someone comes to adopt a Grundo. So I lived hidden in the Adoption Center of Grundo Space Station and I counted my blessings, because things could be worse. And then they became worse. It started when the keeper of the Grundo Adoption Center noticed that I kept vanishing whenever a prospective new owner was around. Pointless to say that I wasn’t exactly pleased. I thought the matter over and decided to run away. I waited until the keeper was trying to talk sense into another prospective owner again and sneaked out of the adoption center, into the hangar and hid on board a space shuttle. Very soon the shuttle started and for the first time in my life I left Virtupets Space Station. I had hoped the shuttle would fly to Kreludor, which couldn’t be that different from Virtupets Space Station, but it landed on Neopia instead. Driven more by hunger and desperation than by design, I got off the shuttle and found myself in Neopia Central near the Alien Vending Machine. The landscape was utterly alien to me. I’d have been frightened if my stomach hadn’t rumbled loud enough to frighten even a Grarrl away. I had heard the Money Tree was the location to go if one was a poor Neopet. Fortunately, I found it quickly. Unfortunately, I found mostly rotten boots there. The only thing of worth seemed to be a Red Nimmo Keyring. I snatched it up. I had never owned a toy before. In the Virtupets Space Station I’d have given my left arm for such a thing. Now that I had one, the only thing I could think about was that it wasn’t edible. A passing Blumaroo heard the upset grumble of my stomach. “Faeries just like helping Neopets,” the Blumaroo said with a shrug. I went to see the Soup Faerie. “Aren’t you a sweet one? What can I do for you?” the Soup Faerie said when she saw me. She stirred her giant pot. The smell coming from there was delicious. The Soup Faerie studied me for what seemed to be an eternity, and then she shook her head sadly. This time she didn’t add the Sweety. Then she brightened. “No. Thank you for nothing,” I said. Where could I go now? I remembered that the Blumaroo had said Faeries liked helping Neopets. Maybe the other Faeries wouldn’t be as narrow-minded as the Soup Faerie. I decided to visit Faerieland. Faerieland is even stranger than Neopia Central. It lies in the middle of the wilderness as if it simply had crashed out of the sky. It’s full of faeries and winged Neopets in pastel colours that flit about everywhere. 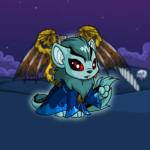 I was told those were Faerie pets. The wings were apparently necessary, because Faerieland used to float in the sky. It really had crashed down. Figures! Despite the crash-landing, there was a general cheer and happiness in the air that was really depressing. If one is feeling totally miserable, nothing is worse than if everyone around one is sickeningly joyful. I found refuge on a small bluff, where the buildings were a bit darker than elsewhere. I felt much more at home here than in the pastel-coloured buildings that seemed to make up the rest of the area. Inside the building was only one faerie. She seemed to be a fan of purple, but there was green in her hair and on her clothes too, not to mention the floor, which was covered in green smoke. I took it as a good sign. “Welcome in my home. I am Jhudora. Who are you?” she asked. She gave me a very strange look and then held up a lollypop that was purple with a green face on it. My stomach rumbled. That looked far tastier then the wormy gruel-paste we got at home. Her smile was mocking, as if I had said something incredibly stupid. I decided to take it as a compliment. At least in her eyes I was a normal, dumb Grundo and not some hyperintelligent freak. “Oh, I want you to find me a Red Nimmo Keyring,” she replied. I hesitated a moment. The keyring was all I possessed, but my empty stomach convinced me quickly to give it to her. “Here is your Poisonous Lollypop,” Jhudora said and handed me the sweet. I thanked her and left her home, the lolly already safely in my mouth. I ignored the strange look she gave me. After I had eaten the lolly, my hunger became a bit better, but all of a sudden my tongue felt swollen and floppy and drool started to fall out of my mouth. I know our keeper claims this is normal for a Grundo out of the adoption center from Virtupets Space Station, but it normally doesn’t happen to me. I went to a near pool to clean the drool from my face and drink something. There was a faerie with a fishtail near the pool, who gave me a sympathetic look. She handed me a vial. “Use this wisely,” she said. “You can call me X,” I replied. I was already in the process of drinking the potion down. The faerie frowned and looked as if she wanted to say something, but then she just shrugged and sighed. “I don’t feel better,” I complained after I had finished drinking. Angrily I left and went back to Jhudora. “I think there was something wrong with your lollypop,” I said. “Why are you giving out poisonous food?” I asked, enraged. “Make it go away!” I demanded. Jhudora gave me a nasty look, but she produced a jelly with purple spots. I quickly grabbed the jelly. Like she had promised, my tongue returned to normal. Even better, my stomach finally stopped complaining, though I was still far from satiated. Then I suddenly started to feel sick with my whole body. And here I am: Sick, alone, without a single Neopoint or any other possession and all that is left to me is the realization that Faeries aren’t helpful at all. They are a menace. What I am writing now is so strange that I still have trouble believing it. It began shortly after I had left Faerieland. I had no real idea where to go from there. All places seemed equally bad, but at least they wouldn’t be filled with the winged Tyrants. Maybe I could find whoever had made that place come crashing down and thank that person, I thought grimly, as I set one foot in front of the other, shaking with fever. I nearly didn’t notice the other Neopet – it was a green Ruki- and his owner. They didn’t notice me at all. I guess out there in the wilderness, green isn’t the most noticeable skin colour. The Ruki didn’t look happy at all. The owner brought the Ruki, who had started to shake, into a cave. Curious, I followed them. They were greeted by a strange looking Scorchio, who lead the Ruki in front of an even stranger looking machine, and made it sit down. Suddenly the Ruki began to cry and wail, begging his owner to not do whatever she was doing, but the owner just watched with a stony face. The Scorchio focused the machine on the poor Ruki. I had seen enough. I left my hiding place, ran to the Ruki and threw myself protectively in front of it just as the machine released a ray. It hit me square into the chest. I came carefully to my feet. The strange Scorchio seemed pleased for some reason, which probably only he knew. The owner was furious. “That should have been your colour!” she shouted at the Ruki. I didn’t want to be some pastel-coloured, pink-winged Neopet. I certainly didn’t have the heart of one of those traitorous faeries. The owner looked at me thoughtfully. I ignored her. “Go to Faerieland,” the Scorchio suggested. Figures. If that isn’t the crowning touch of a horrible day. Not much later, I found myself next to the pool with the fishtail faerie again. I gave the so called Healing Faerie a nasty look, but she smiled benignly at me. “I have no bruises,” I snapped. “I didn’t buy a brush!” I screamed. The faerie frowned at me. I still don’t know why I told her my story. Probably, because I needed to tell it someone and she was the only one who would listen. She waved her hands and suddenly I felt better. The illness had been banished from my body. The Healing Faerie smiled at me. “She did not help me,” I protested. The Healing Faerie folded her hands and gave me a hard look. That succeeded in making me silent – for a while. “That you did.” There was laughter in the Healing Faerie's eyes. I felt very stupid, which is kind of embarrassing, if one is used to believing one is too smart for one's own good. “She has?” I said doubtfully. Actually these days I wished I was a little more intelligent. If I had employed some common sense with Jhudora, I wouldn’t have eaten her poisonous lollypop. Deciding it was time to face my new appearance, I stepped forward and gazed into her pool. No pastel colours or pink wings for me. My body was midnight blue and my eyes gleamed like Neopia did if one looked at it from space station. My wings were silky black like space itself and there were lights dancing in them. A tear ran over my cheek. It glittered like one of the stars I love so much. I am sitting in the adoption center of Virtupets Space Station and look out of the window to gaze at the stars. I have decided to give getting owned a chance. At the very least I would get a name out of it. I am tired of calling myself X. I want to be an individual with a proper name of my own. The way back here hasn’t been easy, but the worst challenge came, when our keeper demanded that I give up my faerie colour. Space Adoption Agency allows only Grundos in blue, red, green, yellow, purple, white or brown. For some reason I decided on green once more. Maybe it is because I am used to it. I expected to feel insignificant again after I had used the brush, but I do not. Even if my skin is green and my eyes are red, I am holding the heart of a faerie and no paintbrush can change that. “No loss. Which Neopet would want to be adopted by you?” I say with a laugh. “I have the heart of a faerie,” I say proudly. “So are you going to adopt me?” I ask, excited. The boy seems nice. If he adopts me, I’ll probably not just get an owner. I’ll get a friend. I ponder that for a moment.